Curious to know what is new to the site? Well come here all the site related news that hasn't been posted already on the widget will be placed here. New to the site and want to know the rules of the site? Look no further all the site related news are placed here. New announcements for the site as well as updates on templates, rules and the like will be placed here. This is mostly for staff but members are free to look in here as well. Ready for some events? Well come here to read up on the latest events that are currently happening right now on the site. Come here to sign up for them, or even come up with ideas of your own. New to the site and want to introduce yourself or are you a member that unfortunately has to leave for a bit? Well come here to introduce yourself or say your good byes. Anything on the site causing you discomfort or confusion? Do you have any suggestions that might help the site? Well come here post your concerns and suggestions, the staff would love to help out. Want to call dibs on a character to look like? Well come here the list to claim your character's appearance is located here! Feel like you deserve a higher position than you started off as? Well post a new RP Sample here and the staff very well might bump you up to a higher rank. Remember description, length, and grammar is key. Here is where you can find our character templates for all the available races of the site, here you can also post your character application. Good Luck! Here is where the Technique Templates for all the available races of the site are located, here you can also post your technique applications. Good Luck! Here is where the equipment templates of the races available to the site are located, here you can also post your equipment application for your character. Good Luck! Here is where the organization templates for the available races of the site are located, here you can apply for an already made organization or make your own. Good Luck! Have more history you want to add to your character for character development? Well this is the place for you. Want to role play with someone but confused on how to start? Well make a post here and see who is willing to role play with you! Want to make some Yen or even progress your stats on your character? Well come here and look at the mission board and take the challenges requested of you. The world formally known as Earth. Here is the home of the race of Humans, it is here that dwells dark presences of Hollows and the like. It is dangerous to be a human in this world, but humans have resources and smarts to defend for themselves. Here the inhabitants attend school, go to stores, get jobs and the like. Quincy and Vizards also live in this world. Here is the dimension of the dead, here are housed of an organization known as Gotei-13. 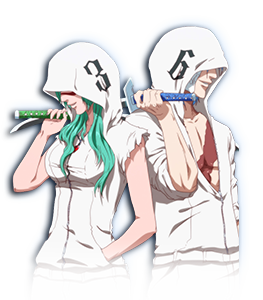 Their main goal is to keep the peace within the Seireitei, which is the home of the Soul Society. Here are a group of races known as Shinigami who serve to protect humans in which they harvest and purify the souls of the dead before they become hollow. Here comes the birth of strange weapons, research, and abilities none other have seen. A cold desert covered in white sand where it is always night with a crescent white moon hanging in it's skies. 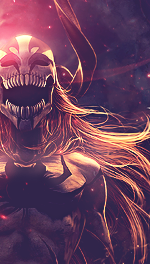 Deep in the desert lies the home to a group known as the Espada which house the Race of Arrancar. 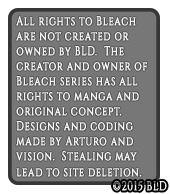 This land is home to the Arrancar and the Hollows, however it is also the pathway into Hell's Gate though it is said that the hell's gate only opens up for the souls of the damned who failed to even turn into hollows. Want to talk about something random? Well come here anything is welcome, besides pornographic material please keep that out of here. Caught the latest manga of an anime you like? Wish to discuss it? Well come here and feel free to do so! Are you an artist? Do you like to tell stories? Come show us your stuff. Post it up for all to see, note that pornographic material is not allowed, we respect that it is art but under the laws of forumotion we can not allow it. Want to affiliate with us? Well feel free to do so, this is guest friendly we ask that you make your section guest friendly as well, don't forget to read the rules and thanks for picking this site to advertise with! Are you a coder, do you want to test out your codes? Come here and try it out, if the staff likes it we may just use it! Want to make yen making graphics for users? Come here and set up a shop, don't forget to read the rules! You got a gold thumb and feel lucky? Well roll the dice and see if you make the money you want. GAMBLE AT YOUR OWN RISK. Here are all the old character, technique, weapons, organizations, as well as the deceased.